Day 5: (L-R) Eric S. Townsend (sport coordinator, WPFG), Wesley Beins (silver-SGP), John O'Sullivan (gold-IRL), Genadijs Kaminskis (bronze-LAT), Shanna Lewis (venue manager, Breakers Sky Lounge). Photo courtesy of Bob Lerch. FAIRFAX — Day 5 of the Pocket Billiards competition from the World Police and Fire Games has been finalized. The final 8 competitors raced to six. In the end, it was gold once again for John O’Sullivan (Ireland), silver for Wesley Beins (Singapore), and bronze for Genadijs Kaminskis (Latvia). In the round of 8, the results were Wesley Beins (Singapore) def. Doug Moreau (Canada) 6-2. Genadijs Kaminskis (Latvia) def. Michael Grosso (USA) 6-1, John Griffin (Ireland) def. Joe Rodrguez (USA) 6-3, John O'Sullivan (Ireland) def. Chris Gloerson (USA) 6-0. Moreau, Grosso, Rodriguez, and Gloerson were eliminated from medal contention. In the final four, it was: Wesley Beins (Singapore) def. John Griffin (Ireland), 6-5. John O'Sullivan (Ireland) def. Genadijs Kaminskis (Latvia) 6-4. Beins and O’Sullivan headed to the gold-silver match, while Griffin and Kaminskis landed in the bronze medal-4th place contest. In the finals, O’Sullivan recovered nicely from an unlikely early 8 in just the third rack. He then worked like clockwork and produced a break and run to cap his 6-3 victory. 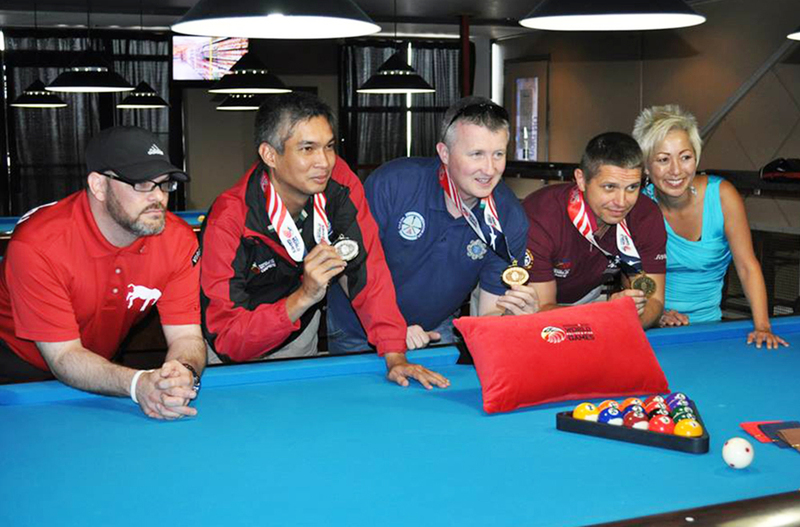 It wasn’t quite the same form for Beins, who won the 9Ball tournament for Singapore earlier in the week. The real drama occurred in the bronze medal-4th place matchup between Latvia’s Kaminskis and Ireland’s Griffin. Still reeling from his hill-hill defeat to Beins (which denied an all-Ireland final), Griffin fell behind early 4-2. The Irishman fought back nobly in forcing a 5-5 lock. After a dry break from Griffin and one turn at the table apiece, the Latvian caught fire. Faced with a tricky cut on the winning 8Ball, Kaminskis dug deep and dropped the black. An understated but gritty competitor, the municipal policeman dropped to his knees, kissed his cue, and raised it triumphantly over his head several times. He was rushed by his teammate and wife as they hugged and jumped in unison. It took five trips to the World Police and Fire Games, and 16 years dating back to the Stockholm competition in 1999, but Kaminskis finally had his medal. “This was my dream,” revealed the spiritual athlete who had shown the sign of the cross before each break of the tournament. After the medal ceremony, venue manager Shanna Lewis requested a photo opp with the competitors, asking them to line up and reveal their country’s colors. Beins and Kaminskis had their country’s names across their shirt backs. O’Sullivan joined the party late and instead faked a mooning. “You ask for Ireland,” quipped O’Sullivan. The audience broke into loud laughter for a fitting end to the crowd-pleasing week. O’Sullivan (IRL), gold, 7-0 W/L, won 34 of 42 racks, .810 WPCT. Beins (SGP), silver, 6-1 W/L, won 31 of 49 racks, .633 WPCT, losses: O’Sullivan (3-6). Kaminskis (Latvia), bronze, 6-3 W/L, won 33 of 60 racks, .550 WPCT, losses: O’Sullivan (0-4), Grosso (2-4), O’Sullivan (4-6).